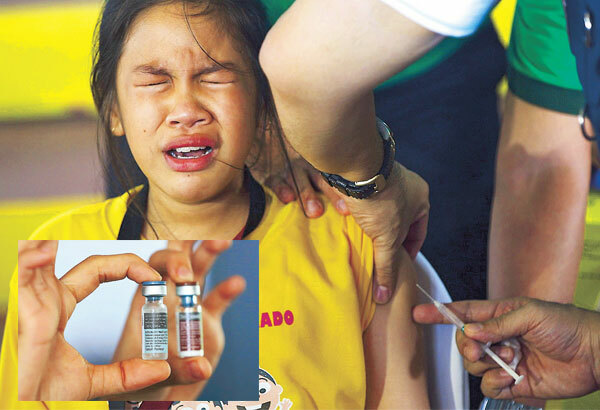 By Jess Diaz (The Philippine Star) | Updated December 6, 2017 - 10:35am MANILA, Philippines (First published 12:00 a.m.) — Nearly a thousand children in public schools had fallen ill over a five-month period after receiving their first dose of the controversial dengue vaccine Dengvaxia, The STAR learned yesterday. The 30 serious cases included two deaths. But the DOH said these “were not related to the immunization program,” which was launched in early 2016. While the DOH said there were only two deaths, based on information reaching the committee on health, at least four children had died. “Their sickness ranged from as simple as fever, nausea, vomiting and body pain, to serious illness that required hospital confinement. The DOH did not have other details, highlighting its lack of proper monitoring and reporting protocols before undertaking the program,” Tan said.She said the House panel does not know what happened to the children, as the DOH has not submitted an update. Of the four children who died, two were from Bataan and two from Bulacan. Central Luzon, Metro Manila and Calabarzon (Cavite-Laguna-Batangas-Rizal-Quezon) are the three regions where the massive Dengvaxia inoculation program that targeted one million children in public elementary schools was launched. Those who died in Bataan were 10-year-old Christine de Guzman and Paul Ramirez. The two from Bulacan were not identified. According to the health committee’s draft report, De Guzman’s father, Nelson, testified that she had her first dose of Dengvaxia on April 16, 2016. “On Oct. 11, 2016, De Guzman complained of headache and fever and would be absent from class. The following day, her fever continued. She was admitted in hospital and was diagnosed with dengue,” the report stated. “On Oct. 14, she experienced difficulty in breathing and stomach ache. It was later found out that she suffered internal bleeding and blood was already coming out of her mouth. In the morning of Oct. 15, she passed away,” the report added. Tan said De Guzman had not had dengue before she was vaccinated. Over the weekend, Sanofi Pasteur, manufacturer of Dengvaxia, said the vaccine was safe for those with previous exposure to dengue but complications could develop for those who had not. Tan said the DOH was not aware of De Guzman’s case, which was reported to her committee by Bataan Rep. Jose Enrique Garcia III. In the case of Ramirez, he was vaccinated on March 31, 2016 and died on April 10. The committee conducted its inquiry in the latter part of 2016. When the panel was almost done with its hearings, the House directed the committee on good government and public accountability to join the probe and look into alleged irregularities in the procurement of the P3.5 billion worth of Dengvaxia.